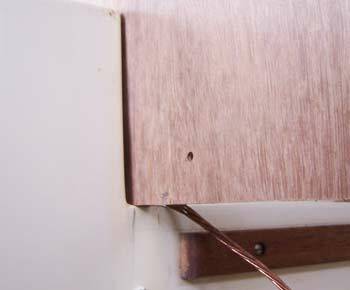 When I had my Tanzer 22 surveyed, the report noted that there was some delamination of the plywood of the bulkhead due to moisture. Both sides have had water dripping in from the chainplates and both sides have had some water damage at the base. Since the bulkhead support the chainplate which can put alot of tension on the wood, it's better to be safe than sorry, so I need to replace the bulkheads, and the bent chainplates. 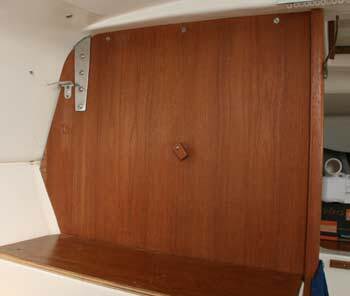 The bulkheads also support a wood beam inside the fiberglass. This supports the mast and can have a lot of weight put on it when the boat is underway. There is some damage on the bulkhead at the very left. The drips from the chainplate are also visible. 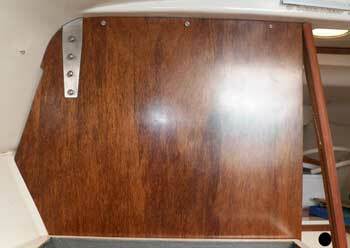 My Tanzer has wood veneer not the plastic I've seen on some of the other boats. There are 3 slot head bolts at the very top that need to be removed. As well there are some bolts inside the locker just back of the bulkhead. There is also a moulding that run from the ceiling to the floor, 4 screws hold it against the bulkhead. it's strong enough to have some part in supporting the deck and mast above. Nice easy to access nuts and bolts in the locker behind the bulkhead. On the starbord side these bolts are under the sink and will be a tight fit to remove. 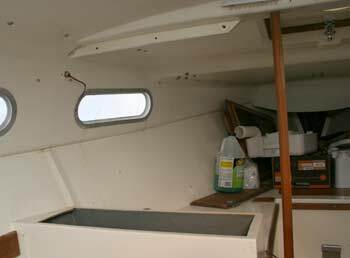 Small Mystery: Why is there a notch cut into the bulkhead on both sides of the boat. For curtains? Wiring? There is no structural reason that I can see. 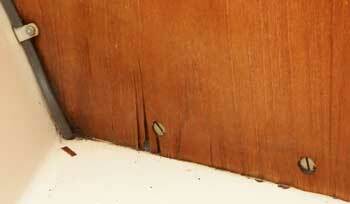 Some damage to the outside layer of the veneer is visible in the corner. On the right the chainplate is clearly bent. This photo is of the starboard chainplate. The bottom image is of the slot where the chainplate goes into the interior. it's easy to see how it could allow water to get in if it's not perfectly well caulked and bedded. There was probably some water coming in after the chainplates were bent. The chainplates get bent when the mast is lowered without loosening the side stays. If the metal is bent back it can cause metal fatigue so it's better to leave the chainplate bent than to try and straighten it back. 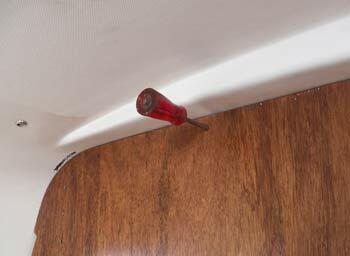 View from the front of the boat shows the fasteners. 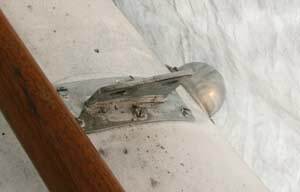 There is also some wiring to be removed, the lightning rod wire, and light fixture wire. Once all the screws were removed including the ones holding the wooden moulding in place it was simple to slide the bulkhead out. I wedged the moulding so it pushed up on the roof slightly. This allowed the bulkhead to slide out without any trouble. Since the mast has been taken down for the winter storage there is no weight on the top of the cabin. I avoided walking on the top while I was doing this repair. I don't know if it matters. I was worried that the roof might sag when the bulkhead was removed but that did not happen. I left the moulding in place to support it just in case. I was also worried that the bulkhead would be wedged in place by a sagging deck but that is not the case. The good guys are winning again. The plywood I removed was not in terrible shape. 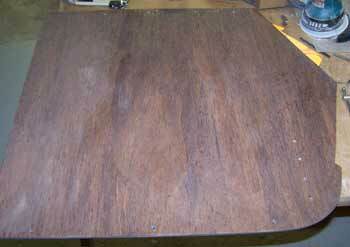 The chainplate holes were dry and the wood was not delaminated except for the thin veneer on the top. There was also slight discolouration on the very bottom where it had at one time stood in water. 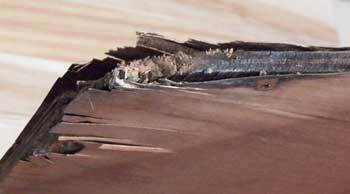 It is 3 layers thick with 2 very thin outside veneers. I took the piece home where I have a piece of Meranti nice and flat on my dinner table waiting to be shaped. I had kept it from the Apple Pie Dinghy build. The space looks very large and empty now that the bulkhead has been removed. I've left the moulding up to keep the roof from caving in! I'm joking, but I want to avoid any distortion that would make it harder to replace the new bulkhead. 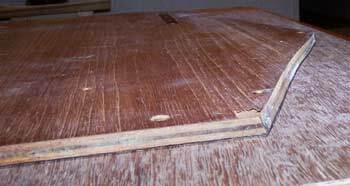 Here is a link to my page about Marine Grade Plywood. 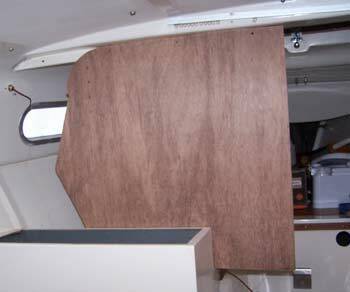 There are very stringent requirements to be met if it's to be true marine plywood. Now I need some information. Can I get a chainplate from Tanzer Parts, or do I just go to a metal shop and have them make me a replacement? I would like to know what the funny little cut out in the side of the bulkhead is for. Since I hate slot screws with a passion, I will see if I can replace the original ones with Robertson head. It might be difficult since it looks like the originals were cut to fit. Maybe it's not a standard size. I carefully aligned the old bulkhead onto the Meranti Plywood. it's 12mm I think, It always feel a bit silly to order a 4 feet x 8 feet x12 mm. sheet of plywood. Talk about mixed up units. The outer edge that is covered by the moulding is the only non beveled edge except for the little cut out. Every other edge has a slight angle. The sides are not straight either. It looks like someone took a sander or a grinder to fit it in the original Tanzer shop. 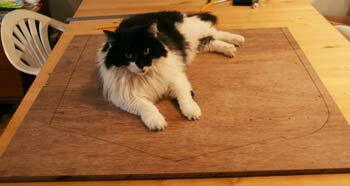 After marking the perimeter and all the bolt holes marked I asked Winston to inspect the piece before cutting. I then clamped the wood to the table. I drilled 2 of the marked holes at each corner of the bulkhead, to have a way of aligning the pieces after they are cut so that I can re align them with no shifting. I used a jig saw with fine teeth blade. It cuts without leaving a burr. I guess it's slower than a regular blade but this plywood is brittle and the edges chip and tear out if the blade is coarser. On the Skerry build I used metal blades sometimes. It was slow but clean. To make the bevels I used a combination of my random orbital sander, a file and sandpaper on a block and my hand plane. it's tedious to shape. My little plane worked in some places but others it was too hard and on end grain and the sander was faster. New bulkhead piece is cut out and beveled. Tomorrow I will take it to the boat and spend a happy afternoon fiddling to fit it. I have no illusions that it will just slide in. After the fitting I know I will need to make it slightly smaller because I plan to epoxy and varnish the bulkhead and this will thicken it up again. I've located a few machine shops nearby and I will now call them and see if they can fabricate new Tanzer Chainplates. I will not make it bigger. There was no sign of stress on the bulkhead and no distortion of the screwholes so I don't see the need. I will also not use thicker and thus stronger metal because I think I prefer to see damage on the chainplate where it is easy to spot than on the mast fitting or the stays, where damage might not be so obvious and more expensive to fix. When there is a lot of stress something has to give, I prefer to know what. Should the chainplate fail there is always a chance of grabbing the end and tying it down to something on deck. There is no chance of doing this if it fails from the top of the mast. 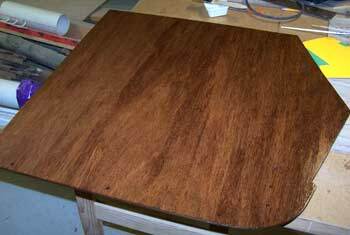 The colour of the Meranti Plywood looks grayish but comes up a rich brown colour once finished as on my Apple Pie tender transom. I painted over the epoxy but the colour was very nice. My day job interfered with my life and I did not get to the boat. I did get the chainplates made though. I had left the original damaged chainplate at a machine shop near my home. The shop is quite high end but so conveniently close that if I count even a fraction of my time it's worth paying a slightly higher price. They did a fabulous job and the new Tanzer chainplates are absolutely identical except for the finish. They put a bit of a satin sheen on. They look very classy! When I brought it in the owner said that there would be no problem making the part and that most of the time would be spent drawing the part in a CAD program. The actual machining is very fast and automated. The shop is immaculate and the floor is full of huge automated cutters, lathes and tempering gismos. They also have a hands on room with more recognizable equipment and men who actually get dirty hands. 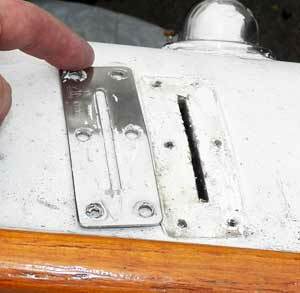 After drilling the various holes, I wrapped the new part in an old sheet and took it to the boat to check the fit. It was almost right. I need to allow for the slight curve of the angles of the fiberglass and cut a bit off the edge. I also checked the mast head to see if the stays or the mast connection was damaged at all. I was worried that the wire might have pulled out of the connector. There was no damage and the stay was in good shape. I still need to round the edge to accommodate the radius on the fiberglass. The top edge also needs trimming to fit against the fiberglass rounded corner. Since these 2 edges won't be showing it's not too stressful. 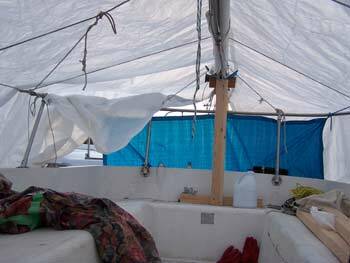 The boat cover makes a tent and it's surprisingly warm and cosy inside. I can sit on the seat without touching the roof. When it gets cold and I want to work on the boat, I can set up a small heater. I took the bulkhead home and sanded it slightly smaller and rounded the inside edges. After testing it for fit I'm happy. The bulkhead is quite tight but fits. I took it home and did a final adjustment to allow for the epoxy thickness and some varnish. Sanded all the holes smooth. There was some burr left over after the drilling. Used a small file and rolled up sandpaper. Sanded the whole surface and erased any pencil mark still on the edges. I thinned the edge that has the trim so it will still fit in after the epoxy and varnish. Dusted everyting and I think I'm ready for epoxy. Put the epoxy in warm water to warm it up after coming in from the cold garage. I'm using slow set to let it penetrate as much as possible. I like having lots of time to apply the epoxy without worrying. Used a small paintbrush to coat all the drilled holes with epoxy. 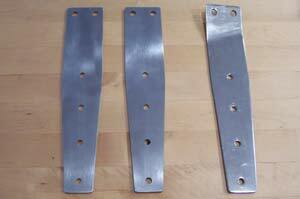 In particular the chainplate holes were saturated. If water ever comes in it won't ever get wet. I paid particular attention to the edges to make sure they were saturated. I love to see the wood come alive after the first coat of finish. it's a lovely rich brown. Photo is a bit blotchy but it's quite even. 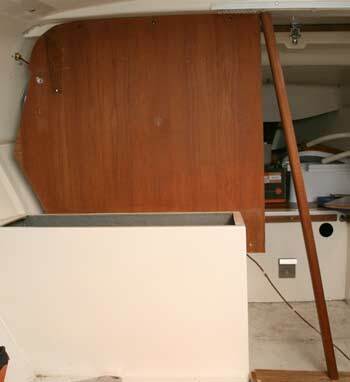 This is the point in the project where if I had to I could put the boat back together and it would work just fine. The rest is for appearances. I was calculating how long I had spent so far. but no rushing involved. So this job takes about 12 hours at a leisurly rate completely re-assembled not counting getting the materials. I had all that from the floor repair. If I had done the 2 sides at the same time it would have saved time but I prefer to have some support on the bulkhead in case there is some sagging. I've had enough of sanding epoxy. it's pretty smooth now. I've re-drilled the holes where epoxy had thickened the opening too much. I've tested the fit in the boat again and it's good. it's interesting that the top had settled very slightly. I will be able to push it up but it had come down about 2 mm. I'm glad I left one bulkhead up and a support as well. I'm using Behr spar varnish on the carefully dusted bulkhead. The colour is slightly browner than the original but it's a lovely colour. I'm planning to put several thin coats. I'm in no rush to finish. First coat is on and drying. it's going to look nice on my little boat. After several coats of varnish, I dulled it with extra fine steel wool and waxed it. The bulkhead feels lovely and has a nice dull shine. it's far from perfect but will pass the 4 feet rule. If you can't see a flaw at 4 feet it's good enough! Finally a lovely sunny day and I brought the bulkhead and starting installing it on the Tanzer. I had to push up the top a small amount but there was no real difficulty. My port navigation lights have little screws protruding and one was digging into the bulkhead. I had to go unwrap the boat and unscrew it. I'll replace it with a slightly fatter and shorter screw that does not extend into the bulkhead. I used an awl to line up the screw holes. It worked well and I got all my bolts in place. They all lined up perfectly. Beginners luck!! I though I would have to re-drill some but I got lucky. I intend to replace some of the bolts. The originals were slightly bent and seemed to have been cut to size from longer bolts. The chainplate hole was gummed up with old silicone. It took a long time to clean it up. 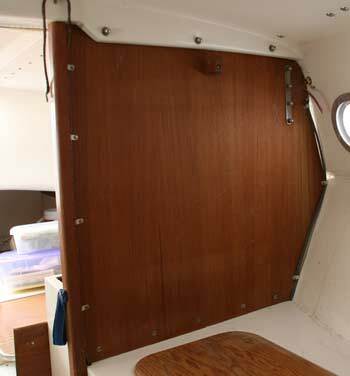 When I can access the outside more easily I will clean up on deck and put 3M 4200 to seal the chainplate and the hole. The Starboard bulkhead is more damaged but I did not realize the extent of the rot. From the outside there seems to be minimal damage but once I took the bulkhead off the inside was quite rotten. 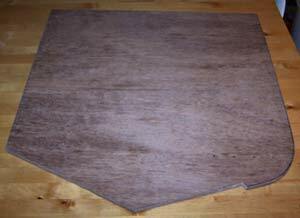 The delamination is not severe except for the thin top veneer. There is rot for about 2 inches around the corner. The rest of the wood is quite strong. I'm wondering if some of the water came from the sink along with the leaky chainplate. It was a bit trickier to remove this side because the sink is in the way and it's awkward not being able to stand nor sit. The nuts live under the counter too. The worst was my mistake. The outside moulding from the port side was held on only by screws. 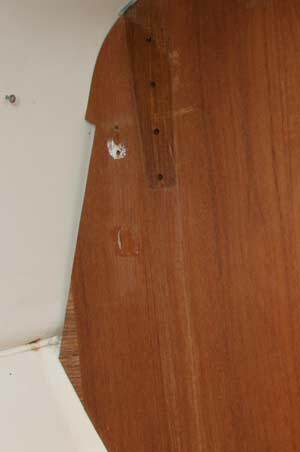 The starboard one is held by screws AND a nut and bolt. It took a while to figure this out. sigh!!! I thought the screw was not catching and just turning freely. Spring is almost here and there is still lots to do with with boat. I'll get this bulkhead done more quickly now that I know how. Launch looms closer now. 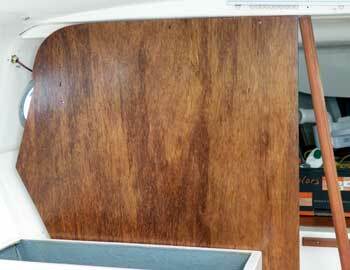 I have completed the starboard bulkhead and sanded and varnished the vertical wood strips that trim the edges. Everything fits. Everything went together quite well. I had to do a couple of fittings to get the bulkhead to slide in but nothing major. The trickiest part was putting the nuts on the bottom. 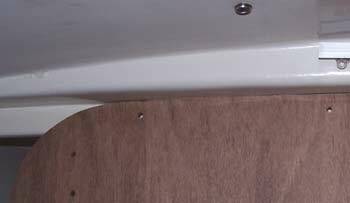 There is not a lot of space between the sink and the bulkhead to hold the nuts. It's not hard particularly just fiddly and I kept dropping washers and having to hunt for them. I removed the chainplate deck fittings and found that they had been seated with silicone. it's always difficult to remove all the old stuff and I had to scrape and sand the deck and the slot. I'm sure I left some inside the slot. I put an extra large dollop of 3M 4200 and replaced the chainplate and secured it from the inside. I then gooped up around the chainplate and replaced the now cleaned fitting. I made a mess but I think I got the plate down and I don't think this will ever leak for as long as I'm alive. I was using compounds that had just began setting off so it was slightly thicker than when it's fresh so it resisted coming out of the tube. My inside caulking is not so very nice. It was setting quite quickly so I did not have lots of time to fiddle and clean as I went. I finally got everything back together. The new bulkheads, the new chainplates waterproofed, all the screws and nuts tightened and the wood trim glued and screwed back in position. I guess I will go back and tidy the caulking after it has set, but for now, I'm done! The good guys win again! This is the 3M 4200 sealant that I used. It remains quite elastic after drying. Unlike silicone, it can be painted. 3M also makes a more permanent Seating / Sealing compound called 5200. A jig Saw is one of my must have tools. This is the kind of saw I've used for my boatbuilding projects. You could do this job with a hand saw but I like a variable speed electric saw. I use a metal saw blade with the plywood. It's much slower than a wood blade but seems to make less burr. In a new project I just try a few different blades and chose the one that gives me the best finish. A lot depends on the plywood material. More expensive blades last longer and stay sharp longer. You get what you pay for. I use the random orbital sander for finishing but also for shaping. I have 60 grit paper that cuts through wood very quickly and helps me adjust bevels and fine tune a cutting line. Better quality last longer and are more powerful. A cheap one still does the job. Another essential tool in my shop is a small block plane. It's a great adjustment tool. It takes a while to learn how to use it and sharpen but it's worth the effort. The plane will take some adjustment and fine tuning before it's ready to be used. Usually have to flatten and polish the bottom plate and the blade. I guess if you bought one of the really expensive ones it would work well right out of the box. 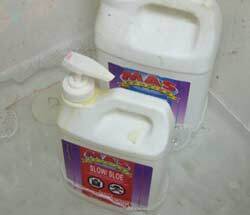 Epoxy makes it possible for inexperienced people to build competent boats. It has great gap filling capacity so this means that if your cuts are not perfect the epoxy can bridge gaps and make a solid joint if filled properly. Most resins are quite similar but hardeners differ a lot. Choosing the right hardener for the job allows you to adjust setting time and other features. Most companies have several hardeners available. Some epoxy is blushing so it has to be cleaned between coats to wash off the waxy amine blush. Other epoxies don't blush. Because epoxy degrates under uv exposure, it must be varnished. 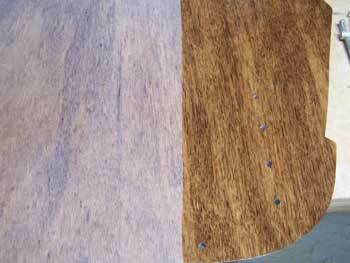 Use a spar varnish with UV blockers. The more expensive brands have higher solid and build up faster. 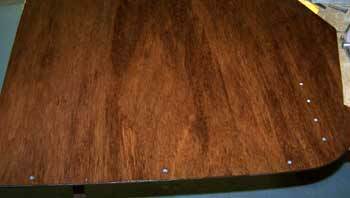 Urethane based varnishes can go over regular varnish but not the other way around. Installed a new roller furler. This will make sailing my Tanzer safer and easier. Teach Yourself to Sail There are many ways to learn to sail. This information is for general knowledge. I don't suggest that this is the only way or the best way to fix your bulkheads. Use your head and do your research.